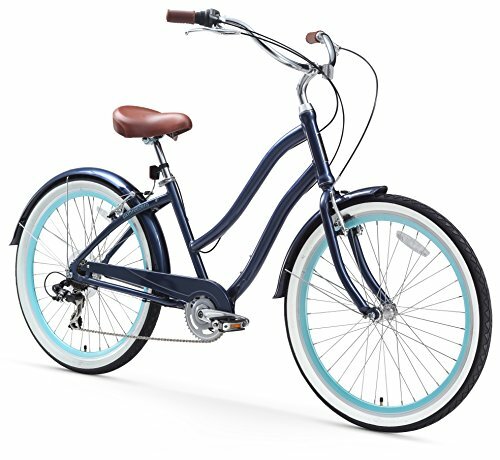 Beautiful Cruiser Bikes for Women! The Cruiser Bicycle: The Most Comfortable Bike for a Fun Ride around Town! I only ride bicycles down here. In my opinion, cruiser bicycles are the most comfortable kind of bikes for women to ride and exercise! I have a ‘bad’ back, I have scoliosis, and it’s really important for me to keep my spine straight as much as I can and that’s why I only ride beach cruiser bikes. I can still get the exercise and have fun at the same time! This is exactly my kind of cruiser bike! It is very comfortable and fun for women of all ages, including older women. If you live on the coast, it’s very important to choose a beach cruiser that has anti-corrosion alloy wheels, and this one does! For me it’s also important to get a lightweight bicycle, especially since I live on the second floor and have to carry my bike up and down the stairs. Oh, by the way, did you also note the awesome large and comfy bike seat? What a Cute Purple Cruiser! 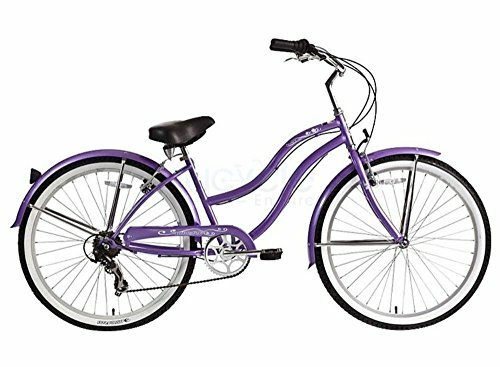 I am crazy about PURPLE and when I saw this gorgeous purple cruiser I had to show it to you! Girliest Cruiser Bike for Women! If you were looking for the girliest cruiser bicycle for sale I guess you can stop looking! 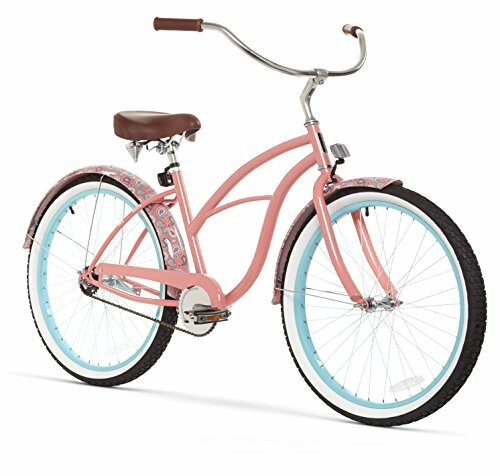 How adorable and gorgeous is this pink beach cruiser? It has cute paisley graphics! Great gift idea for girlfriends or girly wives! Of course I also LOVE hot pink cruisers! I am very girly and hot pink is definitely among my favorite colors! If I had a huge garage or storage room I know I would want to collect these cute cruiser bikes in all colors! 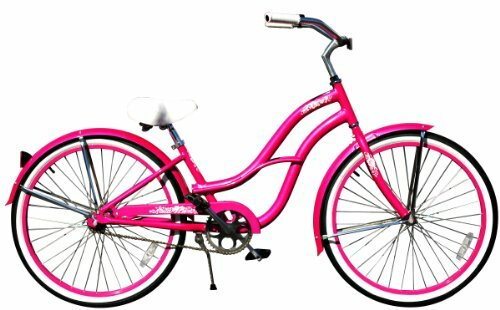 This is a high-quality and gorgeous hot pink comfort cruiser bike for women in fun bright colors! It has a gorgeous hot pink floral frame and pink rims and fenders! You ride it completely upright! It is the perfect girly bike for summer! Perfect to get some exercise while having fun riding in the sun! What a ‘refreshing’ Margarita green cruiser bike! Makes you want to stop whatever it is you are doing and go for a bike ride! I love the comfortable and high white handlebars and comfy bike seat! 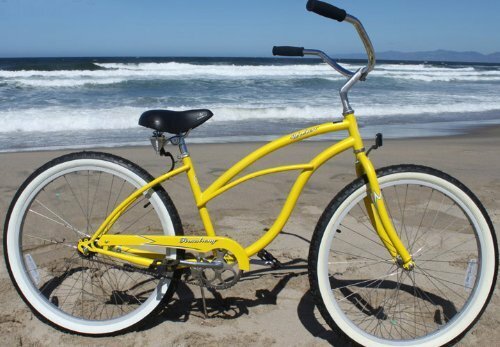 It is a very high-quality beach cruiser bicycle. It is also very easy to put together. This cute cruiser bike will get you many compliments when you start riding it! I bet you can’t wait to try it! Stunning Bright Yellow Single Speed Women’s Cruiser Bike! Just by looking at this gorgeous, fun and ‘happy’ bicycle it makes you go for a fun ride on the beach! 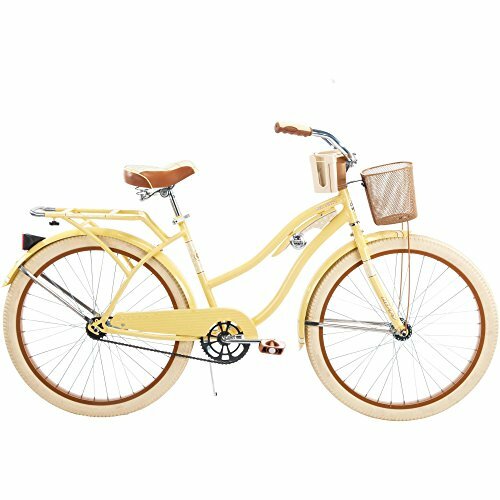 This is a cute and very comfortable to ride yellow cruiser bicycle for women! That’s why you should always choose a cruiser bicycle! If you are looking for a high-end cruiser bicycle with 7 speeds, I believe you are really going to like this gorgeous touring cruiser bike! It has a beautiful design, it is extremely comfortable, smooth and pleasant to ride and it has a 7-speed internal hub. This is the kind of cruiser bicycle perfect for all ‘riding needs’! 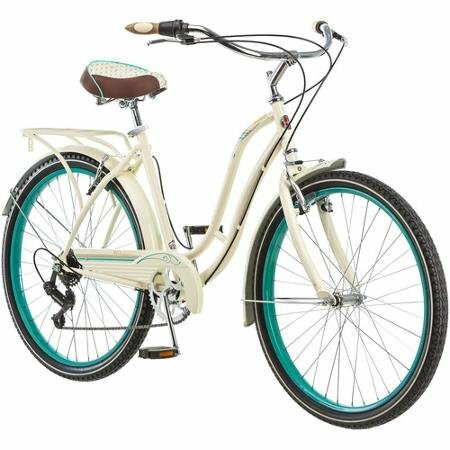 Women’s 26″ Very Cute Retro Beach Cruiser Bike with Cooler! 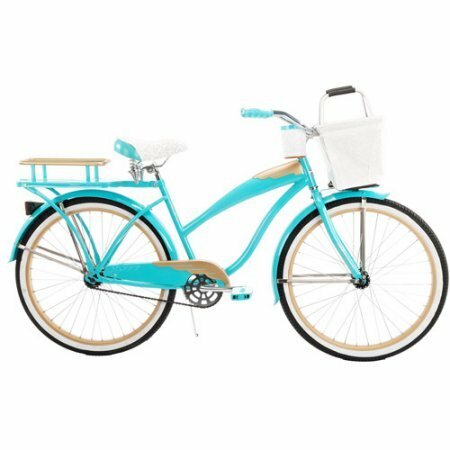 What a cute and fun bright turquoise color retro cruiser bike for women! Check out the awesome cooler, ready to hold your favorite cold beverages! It is the perfect bicycle for cruising around town on a gorgeous sunny day! 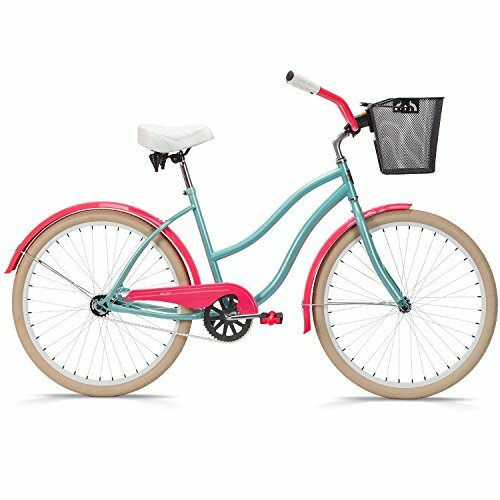 Cute and Unique Colorful Beach Cruiser Bicycle for Women! 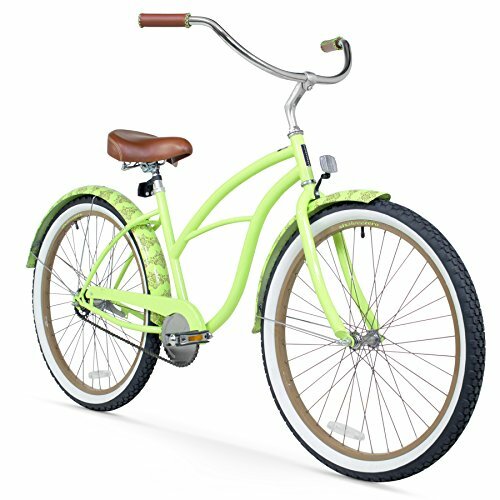 If you are looking for a cute, fun, colorful and very unique looking beach cruiser bicycle for sale, I believe your search is over!! This is a gorgeous colorful women’s cruiser bike for sale! It is also available in many, many other extremely fun color combinations! Here are wonderful tips on how to assemble a beach cruiser bike!